Recently, we’ve been hearing a lot about the CryptoWall Virus, one of the most destructive PC viruses released to date. It usually infiltrates systems by disguising itself as a .pdf attachment in fake emails, but there are multiple versions floating around. 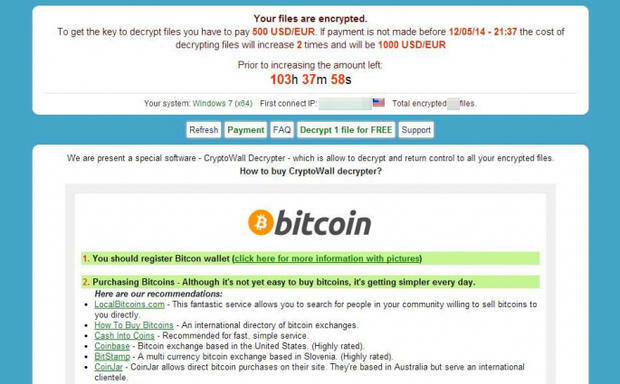 CryptoWall holds documents on your computer for ransom and can permanently corrupt them unless you pay the virus’s creators to obtain a decryption key. So what can you do to avoid this debilitating virus? First and foremost, make sure you are backing up all your files regularly. If you have backed up your files to an external drive or to the cloud, then you can easily restore them and have nothing to fear from CryptoWall. For assistance with data backup and recovery, contact our Network Services Department today. Want to learn more about CryptoWall? See www.bleepingcomputer.com or call us at 863-686-3167 and speak to a Network Services representative.